While Brandon Cronenberg surely lives up to the family name, I can't prescribe Antiviral to anyone needing an exciting sci-fi fix. If I hadn’t previously been told Antiviral was written and directed by David Cronenberg’s son Brandon, man, I never would have guessed. Oh wait, sorry, I forgot I’m typing and not talking to you, because as I typed that sentence, I was laughing fervently at my obviously asinine statement. Brandon shows immense amounts of his father’s influence with his first film, a socially critical science fiction thriller with a heavy emphasis on body horror. There’s plenty of penetrating needles, physical morphing, expelled blood, and sick fantasies to go around, all pushing forth a heavy handed societal issue through a bizarre delivery method. There’s no doubt papa will be proud of this one, but the problem I’m facing in my analysis is that I’m not sure who else will be. To set the scene, Antiviral is all about the celebrity-obsessed state our nation has entered, worshiping these pop-icons with a God-like enthusiasm. Since this is a Cronenberg film though, nothing is done per the norm, and Brandon shows this by establishing a world where people pay to be injected with the viruses of their favorite celebrities, feeling the sickness consume their bodies. Syd March (Caleb Landry Jones) works for the Lucas Clinic, one of the companies whom you can pay for the latest in celebrity sicknesses, but decides to take advantage of people’s obsessions and starts smuggling diseases out through his body which can be sold on the black market. All is running smoothly until one night when Syd is asked to visit one of the most popular celebrities, Hannah Geist (Sarah Gadon), for a simple extraction, which he of course then injects into himself so he can make a huge score on the black market. Unfortunately for Syd, the strain is a new type of virus which no one has dealt with, and his body quickly starts feeling the effects of Hannah’s brand new bug. With time running out, can Syd find a way to reverse this obsession-caused hell? Here’s the thing: Brandon Cronenberg has an awesome idea for Antiviral, and one that resonates mightily with the Snookis, Paris Hiltons, and Chris Browns of the world whom we put on a pedestal for the worst of reasons. Children are learning behavioral instincts from these “role models,” and it’s pretty obvious the effects we’re seeing. We’d like to think Brandon is taking our celebrity obsessed culture one step too far by suggesting people would gladly infect themselves with some type of malicious virus just because a celebrity just had it – but can we? Don’t we already plaster ourselves with the latest actor inspired fragrance, clothing covered with people’s signatures, tattoos of our favorite personalities, full body pillows with Channing Tatum’s likeness ironed on the pillowcase – haven’t we already reached that insane level of worship where instead of a parasite, we’re just re-branding ourselves based on what celebrities say and do? Sorry, downward spiral of humanity rant out of my system now. Here’s where Antiviral gets dicey though, because Cronenberg’s idea is nothing but a one-trick pony, yet we’re forced to watch that one trick for almost two hours. Could you imagine going to a carnival and watching a bear ride a tricycle? Of course you can, that’s hilarious! Can you imagine going to a carnival and watching a bear ride a tricycle for almost two hours? I don’t care how adorable, funny, or unique that bear is, watching the same trick performed for entirely too long wears thin on viewers, and that’s exactly how Antiviral plays out. This brilliant idea is established in the first twenty minutes, but what follows is scene after scene of Cronenberg rehashing the same idea with new events. We can only watch Syd wander around sick for so long before feeling a bit sluggish and run down ourselves. 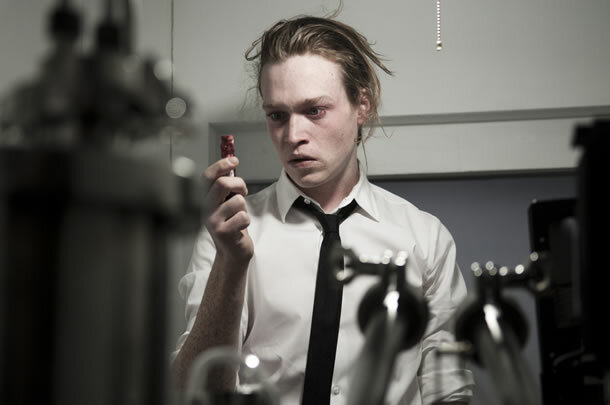 Caleb Landry Jones’ performance as Syd is certainly worth praising though, because for as tedious as Cronenberg’s concept grows, Syd March only gets sicker and sicker. Caleb is repeatedly forced to double over in pain, poke needles into his skin, vomit blood, writhe around on the ground in pain, act disoriented, and pretty much convey the physical brutality he endures as this mystery virus eats away at his life. Jones is every bit physically sickening playing the role of Syd, and does magnificent things on screen with a character whose motives are never fleshed out properly enough for a strong emotional connection. In fact, Jones does his best to carry Antiviral with his disturbingly enticing portrayal, but there just aren’t enough ideas and backstory exploration to keep Syd’s sickening descent justifiably noteworthy. While Antiviral starts strong and invades our systems with real body horror and a topical assessment of the sickness that is pop culture, our white blood-cells are not able to fight off the disease that is boredom. Cronenberg absolutely has a fantastic idea on his hands, but it never grows past being that fantastic idea, and we’re left with a drawn out film that never advances into grander territories. A jolt at the end attempts to wrap things up in this grandiose “WHOA!” moment, but besides being trivial and too late to matter, some viewers may not even make it far enough to catch said ending. My prescription for anyone watching? A few cans of Redbull to keep you awake, Tums for anyone who gets queasy at the sight of blood, and some sort of distraction to keep you busy during duller moments which remind you of laying lifelessly on the sofa. Fun, right?